Standard cycle track in Copenhagen. Sign indicating that you turn left here for the airport. I will fully admit the irony of my epiphany. It's even a bit silly. The story has, however, a decent ending. The nature of my work involves a great many trips to and from Copenhagen Airport. We're lucky in Copenhagen. The airport is the most efficient and well-designed airport I've seen anywhere in the world. It is easily accessible and is located close to the city. You can get there by bus, metro and train, as well as car or taxi, of course. 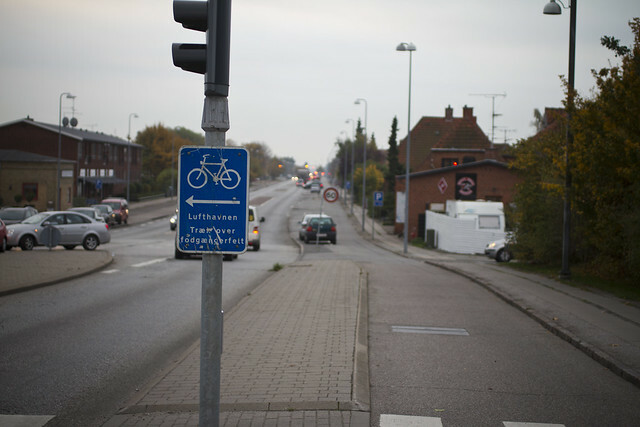 This being Copenhagen, I knew there was fully separated bicycle infrastructure the whole way out there, as well. From every direction. 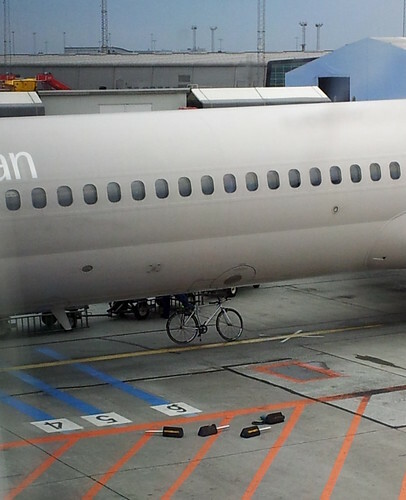 Last October, on the eve of a journey to Zurich for my TED x talk, my friend Ole - previously written about on this blog - asked why I didn't just ride my bicycle to the airport. I shrugged and said that I live 6 minutes walk from a Metro station and it takes 25 minutes on the Metro to get there. I'm not a "cyclist" - I don't demonstratively ride my bicycle everywhere. I like to walk and take public transport, too. I ride my bicycle because it's quick, efficient and rational. My Metro journey takes 35 minutes, give or take, and that was the most efficient way to get to the airport. With that trademark twinkle in his eye, Ole said, "That's what I thought, too..." He pulled out his smartphone and showed me a journey he recorded on the Endomondo app. It's like many other apps for tracking journeys, but being a Danish product, it rightly has "Cycling - Transport" as an option. Ole lives in a different neighbourhood but we live about the same distance from the airport. He showed me the bottom line: it took him 35 minutes to ride to Copenhagen Airport. The same amount of time as I use on the metro. And Ole rides a bog standard upright bike in style over speed. Damn. There is was. Rationality staring me in the face. I woke up the next morning and hopped on my 60 year old Swedish bike with my carry-on bag for the two day trip to Zurich and rode to the airport. It took me 39 relaxing minutes on my old one-speed. 11.39 km in all. I parked at the bike rack outside Terminal 3 and waltzed right up the escalator to security. Feeling silly that I hadn't realised it before. Piece of cake. The trip was, of course, on standard separated cycle tracks the whole way. One little 400 metre section along the motorway was one of the old-school bi-directional types, which was nice. 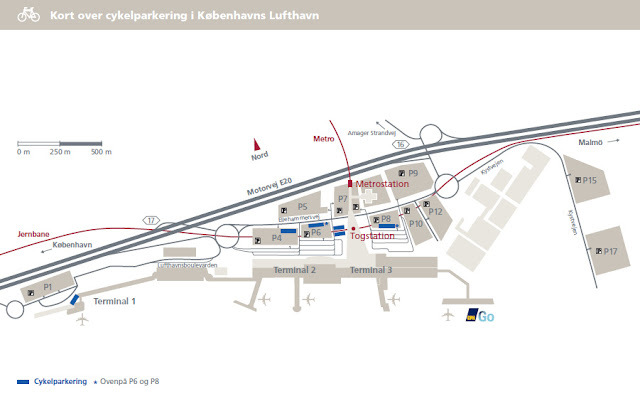 There is, however, ample bike parking at the airport, as you can see on Copenhagen Airport's website. They are often filled. Many employees live in the nearby neighbourhoods, so they ride to work, although I'm sure others have discovered the simplicity of cycling to the airport. So. Great for short trips with a carry-on bag. On my longer trips, I have more luggage, obviously. I would love to ride my Bullitt to the airport on these occasions. The problem is that theft of cargo bikes is big business so I am not keen to leave the Bullitt parked all exposed for a week or so. I rang the airport and talked to a guy in the parking department. He could understand the problem and was kind enough to give me his best guess about which of the bike parking areas would be most secure - an area with a lot of traffic throughout the day and night. Still, I'm not keen to risk it. There are underground parking levels all over the place. Perfect for cargo bike parking but currently only reserved for cars. At Copenhagenize Design Co. we've approached the marketing department at Copenhagen Airport about providing secure parking for cargo bikes and we're looking forward to hearing from them. 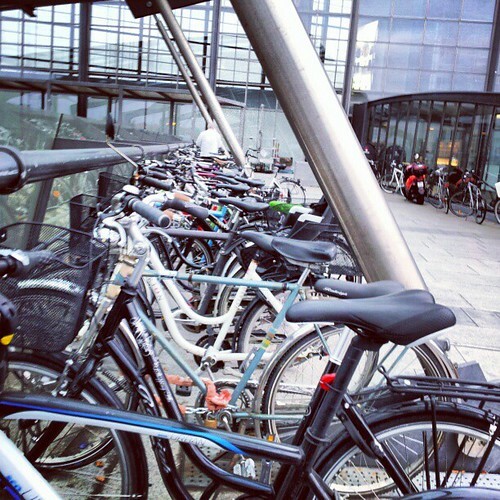 The airport has decent facilities for bicycles but mostly because it's in Copenhagen and it's a necessity. Although the bicycle pump when you arrive in the baggage area certainly impressed this guy last year. The main challenge is that car parking is lucrative. 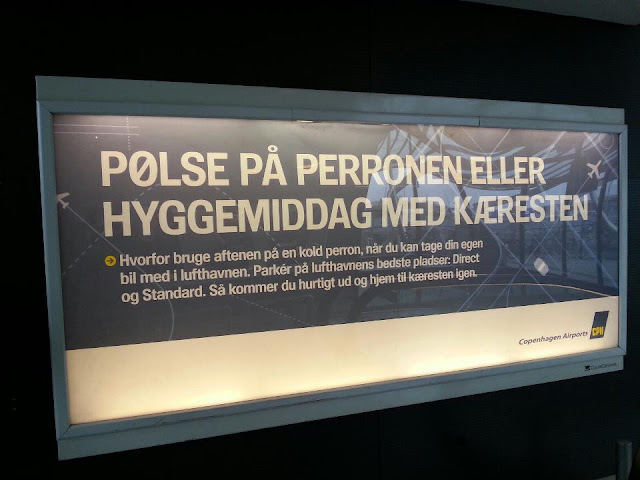 Ole took a photo of this ad at the airport recently. "A hot dog on the platform or a cosy dinner with your partner - Why spend the evening on a cold train platform when you can take your own car to the airport. Park in the airport's best spots: Direct and Standard. Then you'll get home quick to your partner." So the message is clear. Car parking is big business for the airport. Although creating cargo bike parking facilities would, of course, be modern and marketable. Good for the airport's brand. Let's see if they're up for it. We've mapped out where the best locations would be and it would be an inexpensive investment with a lot of return in the form of marketing. Just look at how much focus the oil company Statoil has recieved because of their bicycle stations at their gas stations in Copenhagen. Cycling to the airport is easy, rational and time-efficient. I hope more people consider doing it. It's also a great way to get around if you work there. On the subject of airports and cargo bike, here's an article and film about how I get picked up by friends with a cargo bike every time I arrive at Rio de Janeiro's Santos Dumont airport. 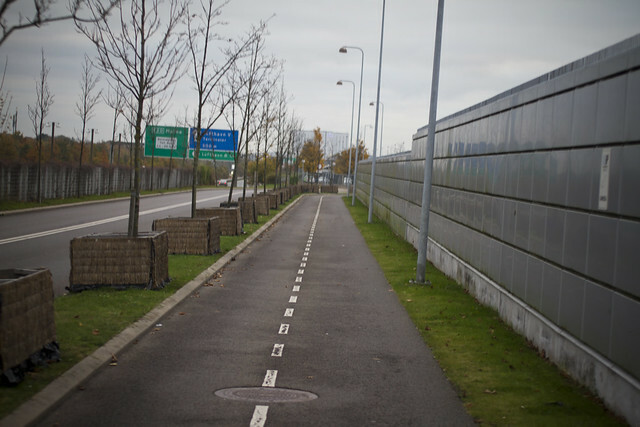 Let's face it: a city with cycle tracks to the airport is a modern city. Bicycles and Airports set on Flickr right here.